Due to the increasing number of web services that we use, we are faced with an increasing number of passwords as well. Managing passwords is an important topic especially when adding new people to the team. A while ago, we took a deeper look into how we manage passwords. Here’s what we’ve learned so far and what has changed over the last couple of months. With our growing team, we noticed different workflows in place when in came to managing passwords. Our management team was using a password protected Excel sheet with shared passwords. Some of us were using password managers (LastPass, 1Password) while others were not using any solution at all. We realized that having no clear password policy is not really ideal. It leaves you vulnerable to attacks and makes/ managing passwords a pain. Before choosing your password manager, I recommend looking closely at your password strategy first. For me personally, managing passwords has always been something with which I struggled. It’s hard to strike a balance between the importance of choosing strong and secure passwords and the practicality of a good user experience that ensures ease of access to passwords. Where do you and your team members currently store their passwords? Who is currently sharing which passwords with whom? Which person/department needs access to which services? What’s the advantage of 1Password? Simply said, 1Password is a password manager. It lets you store and manage passwords as well as secure files and important documents. You only need to remember one password (the so-called master password) to have access to all your passwords for your accounts. 1Password is available for all major platforms (Windows, OS X, iOS, Android) and offers a free trial. I also highly recommend making use of the available browser extensions (for Chrome, Safari, Opera, and Firefox). The great benefit of 1Passwords over protected spreadsheets or files can be found in the sharing and managing of passwords. Here’s how we manage and share passwords with 1Password. When we started using 1Password we created an admin vault which is shared between Florian, our CEO and Josef, our CPO. This admin vault contains all admin accounts of services that enable us to operate Usersnap. In addition to the admin vault, we also created a team vault. The team vault contains accounts which are shared within our organization (like Twitter and analytics accounts). We sync and backup the team vault via Google Drive (we simply use Google Drive, because it’s been our main cloud storage). Dropbox works as well. 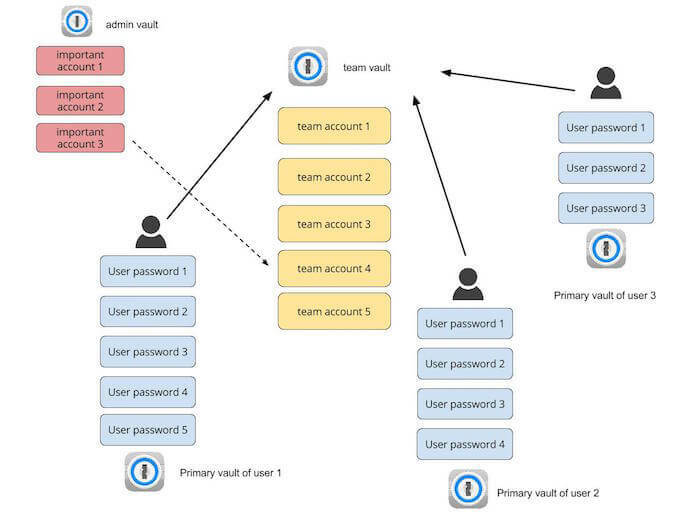 The important thing to note is that we use the team vault for “team/shared” passwords. All user password are saved in each person’s primary 1Password vault. If you are just getting started with 1Password, there might be a couple of things to consider. As you probably already know, the key to a secure password strategy with 1Password is the master password. 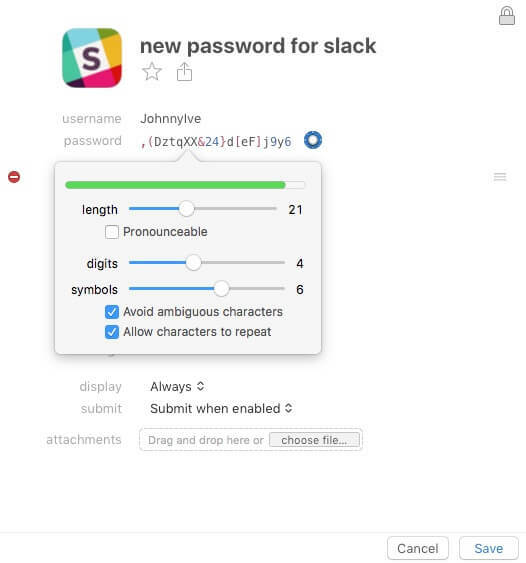 The people at AgileBits and our friends at Codeship wrote some excellent articles on how to come up with a great master password. Go check them out (AgileBits / Codeship). The 1Password Generator is one of big benefits of using 1Password. It allows you to adjust the password recipe to your needs. You can adjust the length, number of digits and symbols and even let’s you generate a password which is pronounceable. If you’re running 1Password on Mac, I recommend using 1Password mini. It’s a little add-on located in your menu bar which provides access to your 1Password accounts. Aside from providing quick and easy access, 1Password mini also let’s you use the password generator to create or change passwords. Creating a strong passwords has never been easier. Because our Usersnapians can choose their preferred operating system, we now have a broad mix of people using Windows, OS X and Ubuntu (yes – our developers (still) love Ubuntu!). 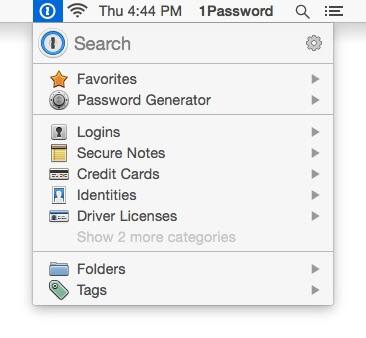 1Password is available for Windows and OS X. However, there is still no official version of 1Password for Ubuntu. But here’s the good news. There’s a workaround which allows you to run 1Password on Linux. The nice people of AgileBits have prepared this guide on how to install 1Password on Linux. Keyboard shortcuts: Copying passwords with ctrl + c and pasting it in your login form with ctrl + v does not working on Ubuntu. Copying passwords only works with the right click on your mouse. Entering vault passwords: When using Mac, you only need to enter your private master password once to be able to access the team vault. On Ubuntu (and Windows), you need to enter the team vault’s password as well. Browser extensions: I’m not sure if this is a common problem or not. However, the Chrome extension on Ubuntu can cause some errors and is not always 100% working properly. Managing passwords with 1Password is as easy as it gets. 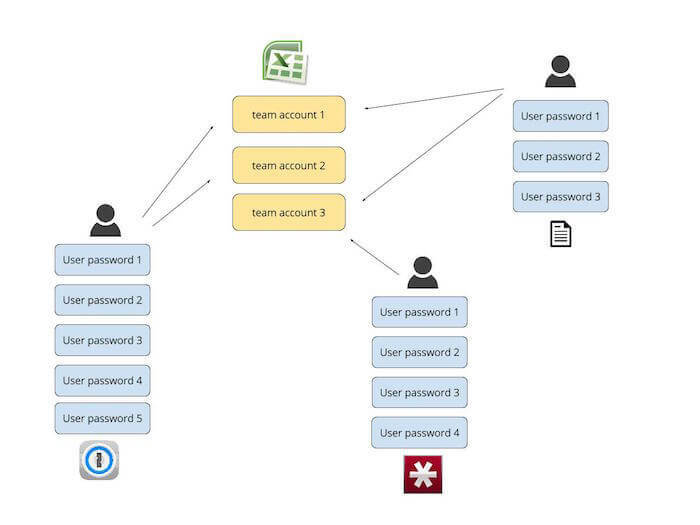 it allows us to store, share and manage team passwords as well as private ones. I’m excited to see how our password management strategy will be in the future as we keep on adding new people to the team. How are you managing your team passwords? Let me know in the poll below! This article was brought to you by Usersnap – a visual feedback & bug tracking software for every web project. How to become a front-end developer! Recently, some people approached me asking for advice on how to get started as a front-end developer. With its ever changing technologies and frameworks, it can be quite difficult and overwhelming starting out in the field of front-end development. In this blog post, you can find 10 tips on how to become a front-end developer! Say Goodbye to your Website Feedback Tool. A new way to stress-free customer feedback. Stop being lazy with ad-hoc feedback. Should you outsource website testing?